Severine von Tscharner Fleming is an organic farmer, young farmers advocate, publisher and organizer based in Downeast Maine. Since 2008 Severine has served as director of the grassroots young farmers cultural organization Greenhorns which produces a literary journal for working agrarians called the New Farmers Almanac.Greenhorns produce many kinds of publications, media, events and exhibits including a weekly radio show on Heritage Radio Network, a popular blog, a series of web-documentaries called www.OURLAND.tv, and a film festival called UP UP Farm! Greenhorns will soon open their 8,000 volume library for agrarian scholars. Since 2013 Severine has served as a founding board president of Agrarian Trust— an innovative national land-access advocacy organization working in the framework of the commons to raise the issue of land succession, support incoming and outgoing agrarians as well as other decisions makers on the land, and to build a national cooperatively owned farmland commons. Agrarian Trust hosts a series of national Symposia called OUR LAND. 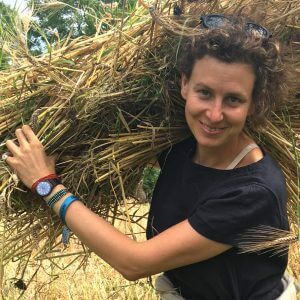 She serves on the board of Schumacher Center for New Economics, the Advisory board of Savanna Institute, and as founding board secretary for Farm Hack (an open-source online and in-person community platform for farm-tools, software and hardware for sustainable farms) and it’s sister organization National Young Farmers Coalition. She attended Pomona College and University of California at Berkeley, where she graduated in 2008 with a B.S. in Conservation/AgroEcology. Severine travels and speaks nationally and internationally on land access, food sovereignty, and the needs and vision of the incoming generation of farmers and ranchers. She is currently at work on a book about Land Reform. Contact Severine von Tscharner Fleming about speaking terms and dates.